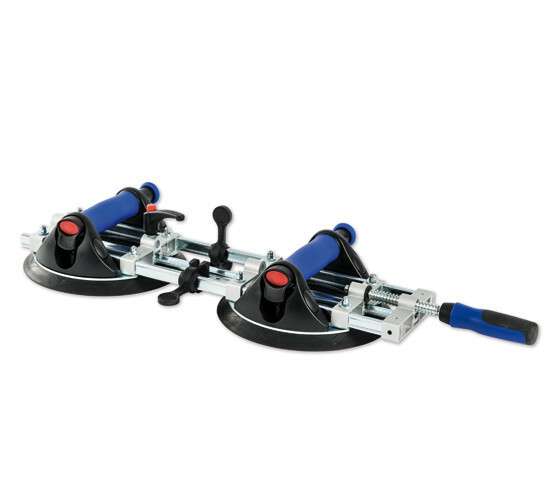 Seaming Tool for Clamping and Repositioning | Handling Technology | Shop | Bohle America Inc.
Easy and Safe Positioning of Large Structural ComponentsTo position large, heavy sheet materials and join them flush and precisely, is a really difficult task. With the Veribor® SeamingTool the perfect position can be precisely determined and readjusted, if necessary, without risking the entire sheet compoundto slip. The Veribor® Seaming Tool is the ideal device for pulling together or spreading apart large, flat, smooth sheets of material exactlyto the millimetre in a controlled manner. For adjusting the sheets, the suction lifters are firmly pressed onto the work surface withthe rubber pads relaxed. By engaging the pump only a few times, the maximum vacuum is generated with a maximum horizontalclamping force of up to 1,200 N. A red ring on the pump tappet enables easy monitoring of the vacuum level. The vacuum can beregenerated at all times in case its level decreases, without removing the seaming tool from the surface. In addition, the vacuumcan also be completely removed by using the valve. If necessary, any height differences between the work pieces can be adjusted with the lateral eccentric lever.